Teams from The Boston Globe and Newsday tied for first place in the Associated Press Sports Editors 2017 contest in long video for the Over-175,000 circulation category. 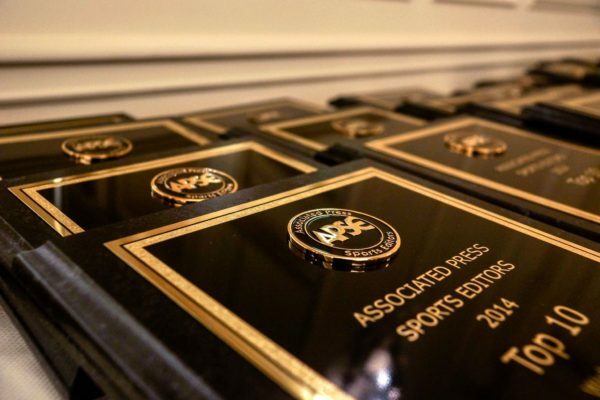 The Globe’s team of Taylor de Lench and Scott LaPierre and the Newsday team of Robert Cassidy, Jeffrey Basinger, Chris Ware, Mark LaMonica and Matthew Golub will be presented first-place plaques at the 2018 APSE Summer Conference Banquet at the Nashville Marriott at Vanderbilt University on June 20. In February, preliminary judges at the APSE Winter Conference in St. Petersburg, Fla., and off-site around the country, selected a top 5, with each judge ranking the entries in order from 1 to 5 separately on a secret ballot. Entries were given five points for a first-place vote, eight points for second and so on down to one point for a 5th-place vote. The final 5 were given to a second judging group, which ranked the entries 1-5 in the same fashion. The winner in each category will receive a plaque at the 2018 APSE Summer Conference at the Nashville Marriott at Vanderbilt University on June 17-20. The second- through fifth-place writers will receive frameable certificates. The long video category judges were judged, foremost, on the strength of storytelling. Visual and auditory quality was considered. The top 5 is listed below with links to writers’ Twitter pages, APSE member websites and winning entries.